You can have easy, total control of your fire in the palm of your hand with the Real Fyre Deluxe Variable Remote Control. This deluxe variable receiver/transmitter set offers total thermostatic control and flame height adjustment for select Peterson automatic pilot kit models. Controlling the temperature of your fireplace has never been easier. 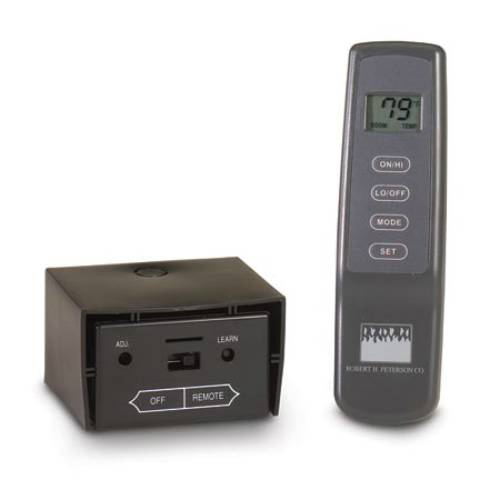 Keep it warm and simple with this deluxe remote from Real Fyre. May I have a manual for this remote? A manual may be found here. Does this unit turn off the pilot light when not in use? This remote will not turn off the pilot, as it is meant to be used with standing pilot log sets. The VR-2a system is indeed powered by a receiver that houses 4 "AA" size batteries. Almost all of the pilot assemblies utilized by our gas log manufacturers will use battery power, as it is usually quite the process to supply electrical power to an existing masonry or prefabricated fireplace. How is this Real Fyre deluxe variable remote control powered? Is it plugged in or does it run on batteries? This will have batteries in both the remote and receiver and will not require 120v for operation. Both the remote and the control unit (connected to the actual burner unit) are battery powered. I've had mine for one full winter season where we ran the logs each morning and night. No issues nor dead batteries so far. Easy to find on their website. Easy to Order. Shipped Quickly. Came with installation instructions. Great product. Like the thermostat feature.